Every 12 years, millions of people are drawn to a spiritual festival in India, the Maha Kumbh Mela, at a place called the Triveni Sangam. It’s the largest gathering of humanity on Earth: over a three-month period, an estimated 100 million people attended the most recent festival, in 2013. The gathering is so big, it purportedly can be seen from outer space. It’s also 2,000 years old. But that’s still not the most amazing thing about it. The Triveni Sangam, where the festival takes place, is the meeting place of three rivers: the Saraswati, Yamuna, and Ganga (Ganges). The Yamuna and Ganga are sacred rivers in India, and highly revered. They are each of a different hue—the Ganga is brownish and the Yamuna greenish—which makes for a fascinating sight. 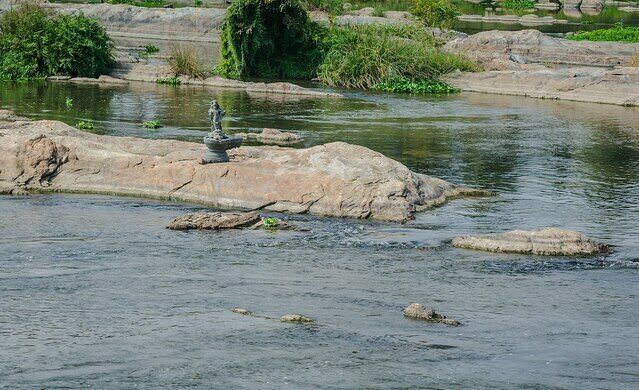 However, the third river, the Saraswati is a mythical river, which supposedly dried up many millennia ago. 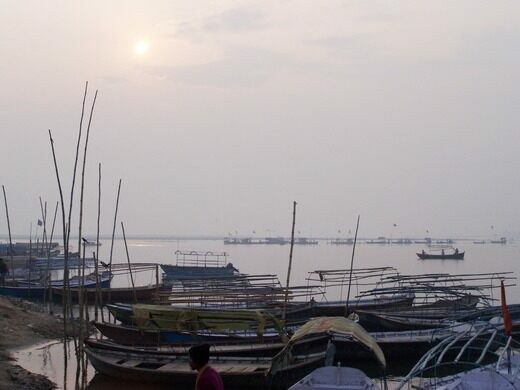 Nevertheless, the Triveni Sangam is to this day referred to as the meeting place of the three rivers. There is a belief that the Saraswati river flows underneath the surface. 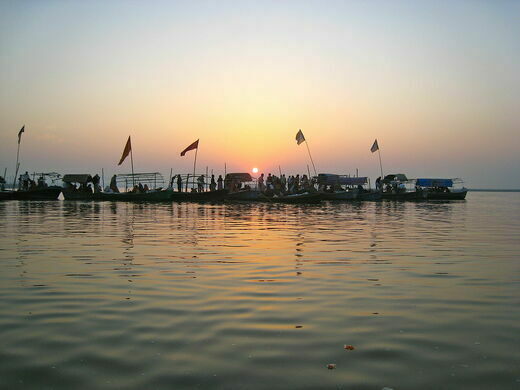 The Triveni Sangam is considered to be a very sacred place in India to Hindus, who believe that taking a dip there will wash away sins and free them from the cycle of rebirth, thereby achieving Moksha. It’s normally a very peaceful place that transforms into an “instant city” when the Maha Kumbh Mela rolls into town. The dates of the Kumbh Mela are based on astrology, which dictates when the waters of the sacred rivers will turn into nectar. It is believed that this nectar can turn mortals into immortals, and legend says that drops of immortal nectar fell onto this spot at the Triveni Sangam during a mythological battle between gods and demons. 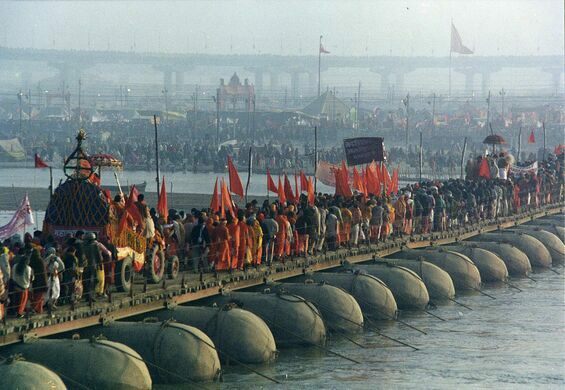 This is the reason the Triveni Sangam is considered to be so holy, and the reason the Maha Kumbh Mela is held there. In 2013, the “city” that was created included 14 temporary hospitals (staffed with 243 doctors), and more than 40,000 toilets. It was policed by 50,000 officers. Approximately 650,000 jobs were created. No one knows the number of pandits (priests) who were in attendance. But visitors to the Kumbh Mela are warned to negotiate with them before agreeing to a puja (ritual) as their fees can be sky-high, and the same is true for boatmen. It seems everything about the Maha Kumbh Mela is overinflated, even prices. 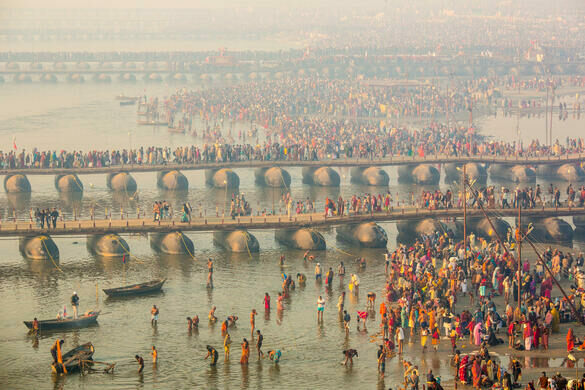 The Maha Kumbh Mela is held every 12 years at the Triveni Sangam and the last one was 2013. In 2019, the Ardh (Half) Kumbh Mela will be held there. Six workers at this food processing plant drowned in a giant vat of ketchup. Siddhartha Gautama sat here and received enlightenment. Legend has it a sacred treasure hidden by an ancient guru was revealed with a burning butter lamp from these waters.